We offer hair removal and eyebrow correction with Brazilian hot beeswax in our clinic in London. We offer a quality service that gives long-term results. All of our specialists have high-level qualifications and significant work experience, while modern wax formulations prevent irritation and allergies. Eyebrows draw attention to the eyes, making them look particularly expressive. Modern fashion trends dictate a particular type of eyebrow shape, preferring naturalness. As before, beautiful and well-groomed eyebrows without hairs sticking out in different directions remain relevant for women. It is best to contact an experienced therapist to adjust your eyebrows with hot beeswax. After all, you can make a mistake by removing the hair in the wrong area, or injure the facial skin, in an attempt to remove the hair by yourself, which may ruin the appearance for a long time. Specialists will do that safely and accurately. Additional components are various types of resin, for example, pine resin. Different oils are used to soften the skin. When choosing a specific substance for eyebrow correction, be guided by the sensitivity of your epidermis to the ingredients, so that its application does not lead to irritation. 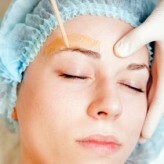 The procedure for the correction of eyebrows with wax requires specific training and skill. First, you need to remove the fringe from the face so that it does not interfere and in order not to hook the strands during waxing. The optimal length for hair removal is 4 mm. Next, comb your eyebrows with a special brush. The wax should be heated to the desired temperature using a wax melter and remain on it. It is important not to burn or injure the skin. You can clear the surface with the help of a specialised antiseptic dermatological agent. Next, the wax is applied to the area for correction in the direction of hair growth with a stick, and when it hardens, then it is torn off against the growth of hairs with a sharp movement. The skin is treated with sedatives after the procedure to prevent irritation. Eyebrow waxing in London is a popular treatment that allows you to give your eyebrows a beautiful shape which lasts. Contact us for more information about this treatment.